I own NNVC from under 10c to over $2. As I have written many times, I am a buy and holder of this stock, expecting it to be an investment of a lifetime. I am willing to ride out the vagaries of day-to-day pricing for the potential fortune awaiting shareholders at the end of the journey. NNVC reversed from LONG to SHORT on June 30 @ $1.83. Notwithstanding my own trading (or lack thereof) of the stock, the Trend Model did a stellar job of getting out of the stock prior to its latest decline. The Weekly Trend Model reversed SHORT about the same time, circa $1.65. That's both Trend Models saying SELL at about the same time. My enthusiasm for the company and its stock is at a multi-year high. Read the series of news items just this past three months. 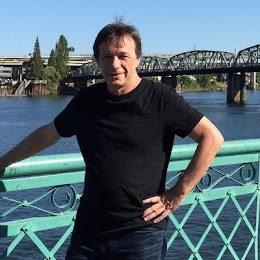 They are on track in their development of a paradigm changing anti-viral technology with a dozen practical applications with billions in potential market share. On this fact alone the company is grossly undervalued. 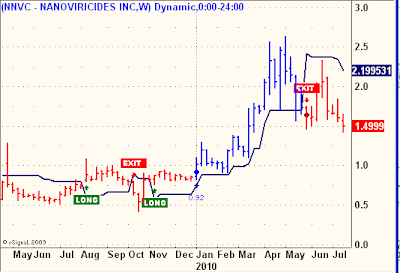 My personal bias to buy and hold NNVC should not be confused with a logical, objective, systematic trend following approach to managing stock positions. The Trend Models work, but only if you let them. 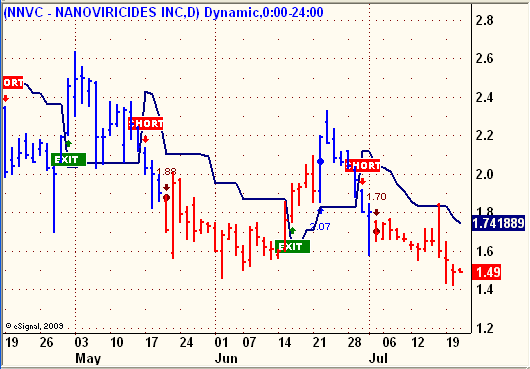 I know many of my subscribers are indeed using the NNVC Daily Trend Model to move in and out of the stock. I also know many of you are not. The tool is there, to use or not use and its never too late to start. In the end, I expect all NNVC shareholders to be vindicated and in a big, big way, for their support and belief in the company. A year from now, we will look back at these price levels with a slap of heads at what a great opportunity to add to positions at a deeply discounted price. The Trend Models will provide a more objective entry, eventually, if you are so inclined. With this one, it is time to think big; big picture, big opportunity. Some of the biggest paper losses in history, i.e. AAPL, GOOG, DNA, were best left alone, ignored and ridden out to blockbuster resolutions. That's where I see NNVC, circa late July, 2010. Where are your great picks that you used to post here? take a stab at a year from please, $3 $5 $10? Closer to $5 then $3. Many, many maturing irons in the fire over the next 12 months. Still steering my boat load full of shares but these stormy seas are making me a bit sea-sick at times. Thank goodness for Dramamine! OK,Allan, you made a reasonable arguement here about NNVC. but ,for the record,technically, NNVC plunged down further, as I am not surprized, to hit the 200 MA'a at the 1.38 area. But it did this on a day when the greater market was jumping up ,showing uncharacteristic strength at a time when the markets and economy are teetering on the edge of badness and collapse. technically for NNVC, a break below the 200 MA's shows next target at the 1.10 - 1.12 area. Maybe this current price action shows that NNVC moves to its own beat independent of the market indexes.... and that might just be a good thing. Now we will get to see what NNVC does if market comes down from the current high ,to retest or break below the latest bottoms. they say 90% of the hard work trading and investing is the patient waiting out process,sometimes gut wrenching and nail biting.